RAFT - Resource Area For Teaching, dedicated to helping educators transform a child’s learning experience through hands-on education, announces Cisco has surpassed the milestone of 30,000 volunteer hours with RAFT. RAFT is elated to celebrate this milestone with Cisco. 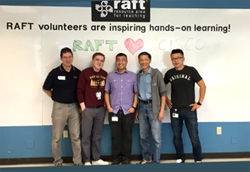 Cisco has been volunteering regularly with RAFT in California for nearly 10 years and in that time over 7000 Cisco employees have been involved. . This is the second major milestone RAFT has celebrated with Cisco. In 2014 a Cisco volunteer group built RAFT’s 500,000th activity kit! Every year volunteers at RAFT assemble thousands hands-on Activity Kits from upcycled materials, keeping the cost of hands-on teaching affordable. These, ready-to-use Activity Kits take the prep work out of hands-on teaching because they come with all required materials and instructions to bring engaging science, technology, engineering, arts, and math (STEAM) experiences to students. Students learn better and are more engaged when they have a hands-on activity to help them grasp complex concepts. Companies and organizations from a variety of industries volunteer at RAFT, having a fun team building activity while at the same time making a meaningful impact. "RAFT is honored to have such a long-standing relationship with Cisco. Over the years, Cisco, volunteers have played an essential role in helping us provide affordable and inspirational materials to local educators," said Grainger Marburg, RAFT CEO. Find out more about RAFT and how to volunteer as a group or individual at http://www.raft.net.